The Olympus brand of cameras continues to surprise. With the Olympus E-5, the players at Olympus are showing they are ready to take on the kings of the photo industry, such as Canon and Nikon. Truth be told, the E-5 is not so much of an upgrade as it is a tribute to its predecessor, the E-3. It certainly advances the brand, as it offers a few details which are bigger and better than the E-3. For instance, the Olympus E-5 offers users a wider screen as well as new features including a level gauge in the viewfinder, multi-exposure, i-Enhance, and a 7 frame AEB. This is definitely not your standard 35 millimeter camera. The E-5 is a subtle upgrade from the E-3 in terms of the camera’s physical features. Due to the larger screen of the E-5, some of the buttons previously found on the E-3 have been removed altogether, such as the IS button and the ‘SSWF’ blue LED light which used to come on when the ultrasonic cleaning system was working. Other buttons have been moved elsewhere along the periphery of the LCD screen. Perhaps the most notable difference between the E-5 and the E-3 is the new movie mode, which functions at around 720P or 30 frames per second HD capture-saved as AVI M-JPEG files. Because of the movie mode, there’s also a “picture with sound” option, as the camera also sports a small microphone. Like many video cameras on the market today, there’s also a stereo mic jack and an HDMI out connector as well, which allows you to truly access all the functionality of a video camera in a digital SLR’s body. There are a variety of art filters accessible with the camera as well, and these are available through any shooting mode the camera has to offer. 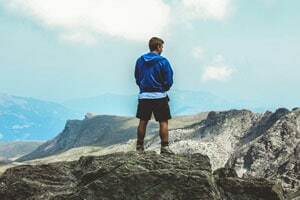 This, in turn, allows the user to take the dramatic shots he or she really wants; there’s no need to work with the photos through other computer photo programs, because the shots have been rendered with art filters the photographer wants. The level gauge also helps the photographer avoid any nasty pitching and rolling when it comes to keeping the shot level. The slightly-tilted images that we all fall victim to every so often are eradicated because the photographer will be able to see right away how level he or she is keeping the camera and immediately adjust for it. In addition, the live view offered on the LCD screen no longer covers the image itself, but is skirted off to the side so the photographer can better see what menu options are available for the image they’re working with. About the only thing the Olympus E-5 doesn’t offer over the E-3 is a huge bonus in the megapixels over the current generation of cameras. The E-5 has a 12 megapixel sensor that every other camera on the market has, but Olympus claims that their lighter AA filter and TruPic V+ processor will offer users a vast improvement in image quality. The dual memory card slot is highly functional, allowing slots for both Compact Flash and SD Media. The card door latch of the E-3 is now gone as well. The E-5 now boasts a sliding palm door latch design which is far easier to manipulate. In fact, the body as a whole maintains the same rugged feel introduced with the E-3, and the E-5 also feels as though it could take a great deal of abuse. This is great news for the photographer on the go, as the rugged design allows users to enjoy a certain degree of protection from the elements when snapping their favorite shots. 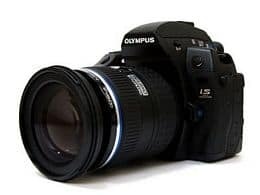 Olympus continues the trend started by the introduction of the E-system line of lenses, and this is a good move on their part, as it has endeared the brand to a generation of photographers everywhere. In fact, the combination of Zuiko Digital lens, the new sensor and the new processor offers better image resolution and clarity than what was seen in the previous models. Noise reduction is great at the lower end of the ISO scale, peaking at approximately ISO 800, but in comparison to the other top models on the market, such as the Nikon D7000 and the K-5, which still offers high noise reduction at ISO 6400, the E-5 struggles somewhat. As for the RAW noise reduction, Adobe Camera Noise has worked with a balance of noise and noise reduction across all ISO levels. The nice thing is, Adobe also has some noise reduction even when the user-controlled NR is set to off. That, in turn, balances the noise and noise reduction with all photos. The E-5 comes with Olympus Viewer 2, which is a versatile in-camera editing program which allows the photographer to apply all of the various color and filter modes to RAW files directly. Unlike other cameras, the E-5 also has the capability of adjusting movie clips. While you can’t do full-blown editing, clips can be trimmed and special effects like fades can be added. Individual frames from movie files can also be saved at their actual sizes, which can help with your editing process once the images are downloaded to your computer. The flash isn’t the strongest, but it’s great when it comes to up-close portraiture and fill-in shots outdoors. However, the E-5 is not as powerful at dealing with noise reduction beyond ISO 100, even with the flash. As a result, there’s an increase in the amount of mid-range background noise which users might find distracting. On the whole, though, the Olympus E-5 is a welcome upgrade to the E-3 and the movie mode offered in the new model is an exciting change from the previous Olympus models. As a top-end camera, users do need to be careful when working with ISO speeds higher than 100, as they may want to make further adjustments. However, it’s important to look at the full picture when it comes to assessing the Olympus E-5 and it’s capabilities. With the added features over the E-3, the E-5 is a handy camera which offers users exciting new possibilities when it comes to photographic adventures.